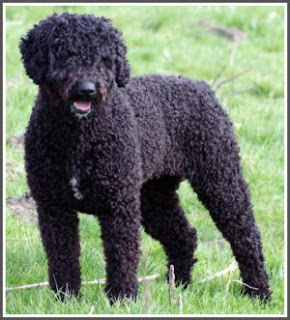 The Spanish Water Dog also known as Perro de Agua Espanol was developed by the shepherds in Spain to be used as herders as well as gun dog breed and to assist the fishermen. They are medium sized lively strong dogs. They have strong elegant head with flat skull and top parallel with the top of the muzzle. They have expressive eyes which are normally hazel, chestnut or dark brown in color depending upon their coat color and they have triangular ears set at medium height on the skull. It has curly coat which has a wooly texture and can form cords when it becomes long. The coat must not be clipped or groomed but should be sheared down once a year and thus should look entirely natural. It comes in a variety of colors as already mentioned above. Tri-colored dogs are strictly prohibited and so is the black and tan or brown and tan combinations. It’s an intelligent, loving, dutiful and devoted breed with natural herding and guarding instincts. They need a lot of exercise owning to their love for work and athleticism. They love work and thus can be trained to perform many different tasks. They are alert around strangers and thus good and early socialization will help them to adjust well with small children and other animals. They should never be brushed but the cords should be checked for matting and if matting occurs then it must be pulled gently. Moreover, they should be bathed only in lukewarm water and that too when necessarily and must be air dried. Ears and eyes should be regularly checked and cleaned to avoid problems and nails should be trimmed.